Submitted by lynn on Wednesday, April 25, 2018 - 4:13pm. It's been a lazy month and our household hasn't done much cooking lately. When hunger struck, bread was truly trending these last few weeks. Are you ready to get bread-y? Here are the latest eats for WIAW (What I Ate Wednesday). I typically leave a jar of peanut butter at work for emergencies. One week I had kidnapped half a loaf of bread from our kitchen and decided to make peanut butter toast. After a virtual pat on the back for following through with breakfast, this thought suddenly hit me... what if I add bananas? The next day I brought ripe yellow fruit with me and BAM! It's the breakfast that bounced around my noggin the prior day. I'm flabbergasted as to why I've never tried this simple combination before. Dennis got a text of my eats and replied that it looked so delicious. Damn right! 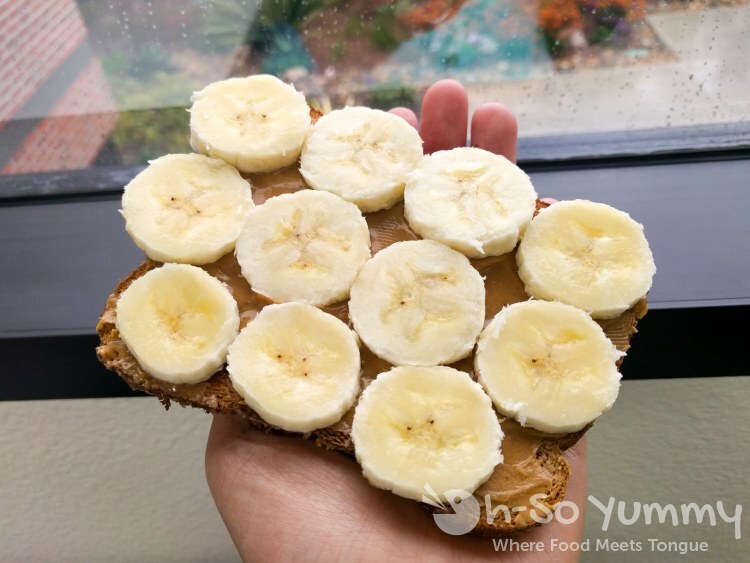 Sounds like we need to schedule this easy breakfast into our morning routine more often! Dennis's birthday is this month which prompted me to peek at my work's employee birthday calendar. It happened to be one of our newest coworker's birthdays coming up so I sneakily asked her out to lunch. Birthday girl chose SuperNatural Sandwiches and she got a free meal from me! 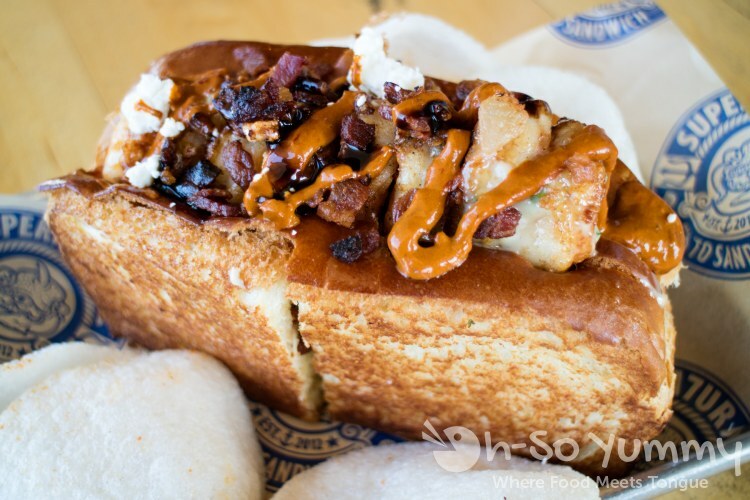 By the way, get your own free birthday food by checking out our MASTER BIRTHDAY LIST. Did you know there's national holiday for just about every food? April included National Grilled Cheese Day which enticed me to order the Aphrodite ($11) - a Shrimp and Bacon Grilled Cheese. An embellished grilled cheese works perfectly right? I loved the crusty perfection and the succulent bites of meat in each bite. My coworker selected the Harpy ($11) - Shrimp, Bacon and Balsamic Glaze. Hers was the pure sandwich form with similar ingredients to mine. This was gobbled up with a gigantic grin. Happy birthday my friend! It was pleasant to pull ourselves away from work to enjoy good company and food. 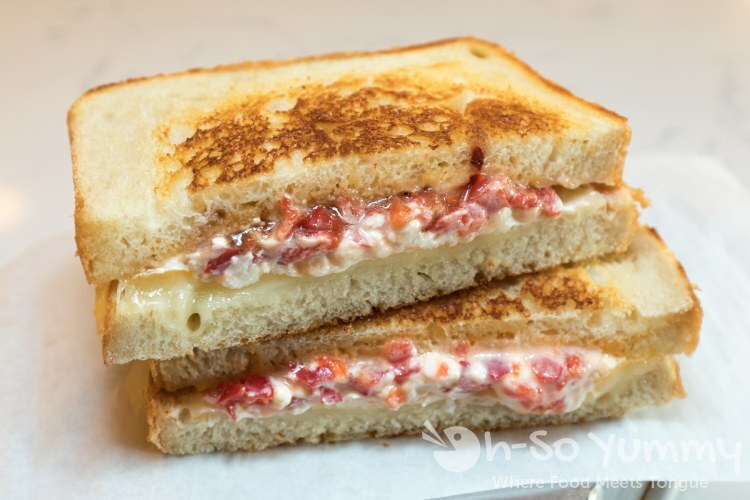 To continue the food holiday spirit, we sampled a few items from a local San Diego spot called Grater Grilled Cheese. My pick was the Modena ($8.90) which adds goat cheese, roasted bell pepper and truffle oil to the restaurant's signature 5-cheese blend. The combo of peppers with goat cheese was deliciously warm under that toasty crust. You better love goat cheese too because it overshadowed the 5-cheese blend that is the base layer of this sandwich. 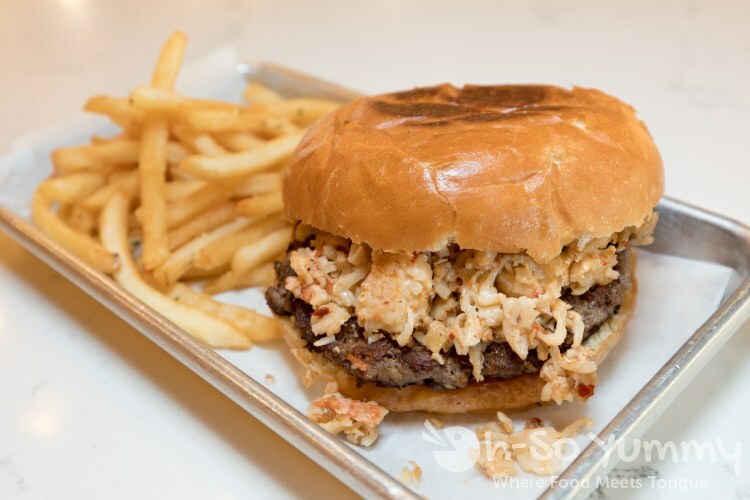 Dennis went for the Grater Surf & Turf ($14.90) which is a lobster spin on the seafood and land combo! The patty was well cooked within soft but hearty bread. The side of fries was fantasticly fresh. Our only complaint was that the lobster was a little too shredded rather than a meaty chunk. 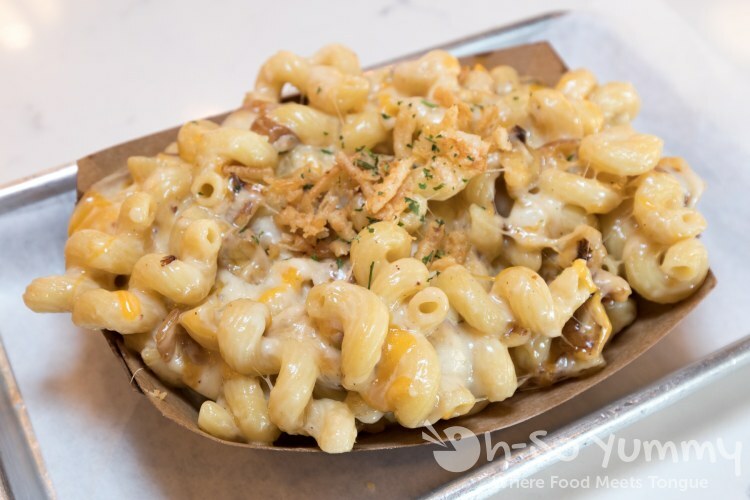 To change it up, we also added in a order of Grater Mac & Cheese ($7.90). This was probably one of our favorite items that day with the oozy cheese and nutty addition of the walnuts. Half of this was taken home as leftovers although it was very oily after reheating. And that, my friends, is how you carb up! When it happens, you just go with the flow! Also, Dennis and I just started redeeming his April birthday offers and we'll be reporting back in two weeks! Don't forget to check out Laura's post for the full linkup to What I Ate Wednesday (via Peas & Crayons). What are your favorite ingredients on bread? Disclaimer: We were invited to dine at Grater Grilled Cheese and the food was complimentary. We were not otherwise compensated and all opinions stated are our own. Welcome back to WIAW! You always make me drool. I definitely didn't eat at SuperNatural enough while in SD! It is still food, too much carb or not, it is still tasty, this week I ate too much chocolate too, but I don't feel guilty about it, just enjoy the food. Sandwiches are always a great option for a quick meal. 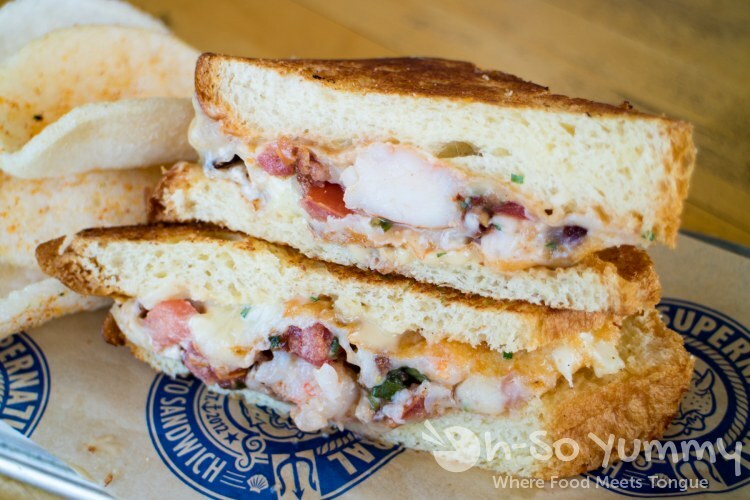 That Shrimp and Bacon Grilled Cheese looks yummy yum. i really should eat more sandwiches! just gotta buy tempting fillers hehe. This made me hungry looking at all these! me too my dear! so much good stuff! My favorite ingredients on bread are butter (if plain) or meat and cheese and some sort of spread. Those sandwiches you made look great. Sadly, I don't like goat cheese, so I wouldn't be trying that one sandwich from Supernatural. I need to add more new places for my bday list from your master list but those won't kick in until next April. dennis doesn't like goat cheese either so it was all mine haha. for birthdays, dennis isn't subscribed to as many newsletters and apps as me but when December comes along, i'm back on it girl!